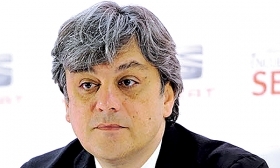 Luca de Meo, president of Seat, Volkswagen Group's Spanish subsidiary, will be the keynote speaker at the Automotive News Europe Congress in Barcelona, Spain, on June 21. De Meo, who has held key jobs at VW, Audi, Renault, Fiat and Alfa Romeo, led Seat to its first profit in 11 years in 2016. His ambitious plan to achieve long-term profitability begins with two new SUVs arriving in the next 18 months. The Italian executive aims for Seat to become a gateway to the group's pricier VW and Audi marques. But he says the brand will not stray from its heritage as a small-car specialist. De Meo has a history with successful small cars. At Renault he worked on the Twingo, at Toyota Europe he played a key role in the Yaris, and at Fiat he was one of the fathers of the 500 minicar. The Rising Stars ceremony and Automotive News Europe Congress will be held June 20-21 at Casa Llotja de Mar and the Hotel Fairmont King Juan Carlos I in Barcelona.